SRG Reports on Drill Results – SRG Graphite Inc.
Montreal, Quebec, October 17, 2018 – SRG Graphite Inc. (TSXV: SRG) (“SRG” or the “Company”) reports today on assay results for 162 new boreholes since announcing mineral resources last June, bringing the total to 557 boreholes over 18,037 metres (“m”) drilled at its Lola Graphite deposit in Guinea, West Africa. In addition to the planned 2018 exploration program, which is now completed, management has decided to extend the drill program to take advantage of the cost-beneficial drill rig the Company has on site. The third phase of the drill program is ongoing with 60 additional boreholes over 3,000 m completed so far. The current drill-hole results cover approximately 60% of the deposit’s surface footprint (see Figure 1). To date, only the weathered portion of the deposit has been drilled, representing the first 30 meters from the surface on average. The additional drilling program includes 10 boreholes designed for testing graphitic carbon (“Cg”) at depths within the non-weathered rock assemblage below the graphite-rich surface saprolite. These drill results should help further understand the reach and depth of the deposit and, provide additional basis for the mineral resource update to be included in the feasibility study expected for H1 2019. 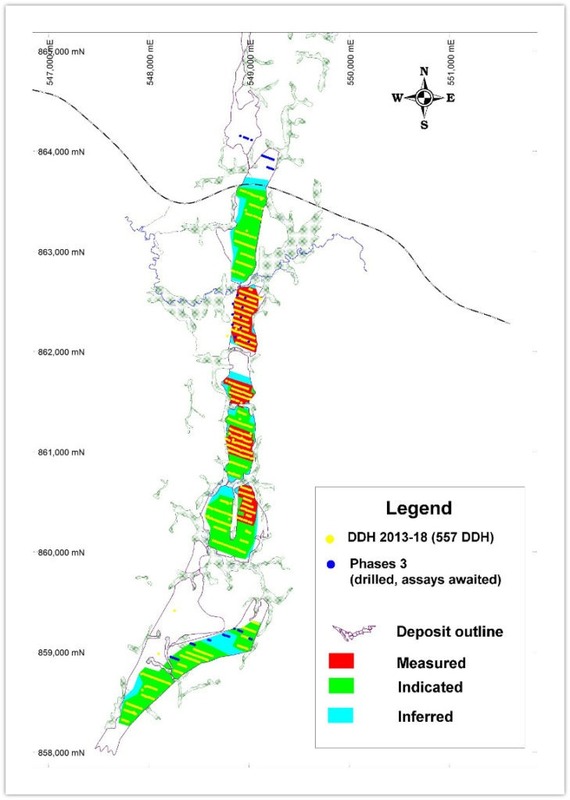 The following link (http://srggraphite.com/pdf/20181015_PR_Drill_Results.pdf) provides a compilation of mineralized intervals for the 557 boreholes drilled and analyzed to date. Mineralized intervals were defined using 1.0% Cg as a cut-off grade (“cog”). Composite intervals defined using a 3% cog are also presented. All boreholes were drilled at an inclination of 50 degrees from the horizontal and cross-cut the geological succession as perpendicularly as possible. The graphitic paragneiss displays foliation dipping between 80 and 85 degrees to the west. Core logging and sampling were performed at the Company’s facility in the town of Lola. Sample preparation was performed by Veritas Laboratory in Abidjan, Côte d’Ivoire. Pulp samples were delivered to Activation Laboratories Ltd., Ancaster, Ontario, Canada. The samples were treated through a multi-stage furnace process to remove organic carbon and carbonate carbon. The remaining graphitic carbon was measured as carbon dioxide in the infrared (“IR”) cell as gas flowed through the cell. Carbon dioxide absorbs IR energy at a precise wavelength within the IR spectrum. All analyses were performed using Eltra instruments. The technical information in this release has been reviewed and approved by Dr. Marc-Antoine Audet, PhD Geo., P.Geo, Lead Geologist, SRG, and a “qualified person” as defined by National Instrument 43-101, Standards of Disclosure for Mineral Projects. SRG is also pleased to announce that EEM Sustainable Management (“EEM”), a Canadian-based independent environment consultancy company from Montreal with significant experience in Guinea, has been selected to revise and update the Lola graphite project’s environmental and social impact assessment to ensure compliance with local and international standards. Forward-looking information is based on assumptions management believes to be reasonable at the time such statements are made, including but not limited to, continued exploration activities and no material adverse change in mineral prices. Although the Company has attempted to identify important factors that could cause actual results to differ materially from those contained in the forward-looking information, there may be other factors that cause results not to be as anticipated, estimated, or intended. There can be no assurance that such forward-looking information will prove to be accurate, as actual results and future events could differ materially from those anticipated in such forward-looking information. Such forward-looking information has been provided for the purpose of assisting investors in understanding the Company’s business, operations, and exploration plans and may not be appropriate for other purposes. Accordingly, readers should not place undue reliance on forward-looking information. Forward-looking information is given as of the date of this press release, and the Company does not undertake to update such forward-looking information except in accordance with applicable securities laws.